PORTABLE LED SCAFFOLDING FLOODLIGHTS comes in a variety of light presentations. Most common is a clamp on style that sturdies the portable floodlight to the scaffolding posts. This scaffolding clamp is rated to hold 2000 lbs of weight. Well over-sized for the portable lighting products that are offered through Bossltg. PORTABLE LED SCAFFOLDING FLOODLIGHTS are offered with LED fixtures. These types of floodlights produce a large amount of illumination from low wattage floodlights. Perfect for single person work areas. 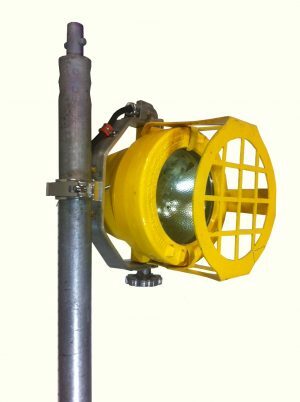 With the scaffolding clamps the fixture can be swivel and repositioned to direct lights 360* if needed. Due to the size of the LED fixtures multiple lights can be positions on scaffold posts to create a high volume of illumination producing a high foot-candle level of brightness for workers safety and working effectiveness. LED fixtures come in wattages from 100w thru 1000w. The 100w LED is the perfect light for scaffolding. Just enough light for worker to perform and small enough not to get in the way mounted on scaffold posts. Large LED lights are available upon request.